As in the previous installment of the series, “The Path of Daggers” is noteworthy mainly for how little actually happens in the book. 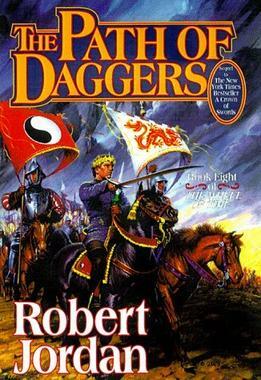 In particular, the first 200-300 pages of the novel are excruciating, as we wait for an event that probably should have happened at the end of “The Crown of Swords” instead. I understand the need for suspense and build-up, but that’s not what’s going on here, and hence the frustration of almost everyone who reads this book. This isn’t 200-300 pages of character or relationship development, it’s 200-300 pages of utter poppycock. The book does, thankfully, get a bit better after that, although I repeat, nothing much happens in the book. Rand becomes monomaniacal, Min behaves well, Faile behaves badly, and women in general stare pointedly at each other and sniff. That latter thing is becoming ridiculous. There are two main sources of conflict in the Wheel of Time series. One conflict is “the Dragon Reborn versus the Dark One.” The other conflict is “women acting haughty and mean, staring at each other until one of them cracks, and plotting against each other.” I like intrigue, and some of the earlier novels were interesting in that regard. But it grows tiresome to read about a staring-match between two haughty women on virtually every page. Not every female-to-female conflict in the real world is haughty or catty. Not every woman in the real world is plotting against all the other women in her life. Not every conflict between women can be resolved by having them stare at each other until one of them sniffs or loses composure. And yet virtually every such conflict in the Wheel of Time series plays out that way. What was a strange aspect of Aes Sedai culture in the first couple of books has become a pervasive and crazy depiction of all women everywhere. It unfortunately serves to undermine the credibility of every female friendship in the novel. I keep wondering what Elayne and Nynaeve and Birgitte and Egwene all even see in each other, because there is very little actual friendship depicted between any two of them. And it’s boring, besides. There are some bright spots here. I enjoy the relationship between Min and Rand, because it seems genuine and it seems they both really do enjoy each other’s company without one of them always yelling at the other. (Guess which gender is always yelling at which.) Despite Rand’s growing foolishness - and who in the world wants to read about a foolish savior? - it is still fun to read about magic and great battles. Perrin is still a great character, and I enjoy reading about him, too. Still, if someone were to ask me, “What is ‘The Path of Daggers’ about?” I’d be forced to say, “nothing much.” Seven hundred pages of nothing much. When do we get to meet more of the Forsaken? When do we get to find out the difference between the True Power and the One Power? Why is that one female character capable of using saidin? What happened to Mat? All of these questions should have been either answered or addressed in this book, and they simply were not. What a waste. How Soon Until I Notice Changes? Everyone, Everyone! I Am Not A Racist!